All nineteen of our workshops are practical, exciting and inspiring. "Many thanks for coming in to our school and making the day so enjoyable for everyone – your workshops really were the talk of the school (amongst the children and staff) and would definitely recommend your workshops to others in the future and hopefully ask you back in the future too." Booking information can be found below the workshop details. Contact us at email@spherescience.co.uk or click here to complete our online form. Click here for a list of all our primary workshops. A set of contrasting movement investigations about air resistance including making gyrocopters, hoopsters and kites. "Good progression of investigative skills/ideas. Good discussion of variable/constant. Reinforced good practice in fair testing." An exciting challenge to produce a working model of how the petrochemical industry extracts and separates components of crude oil. 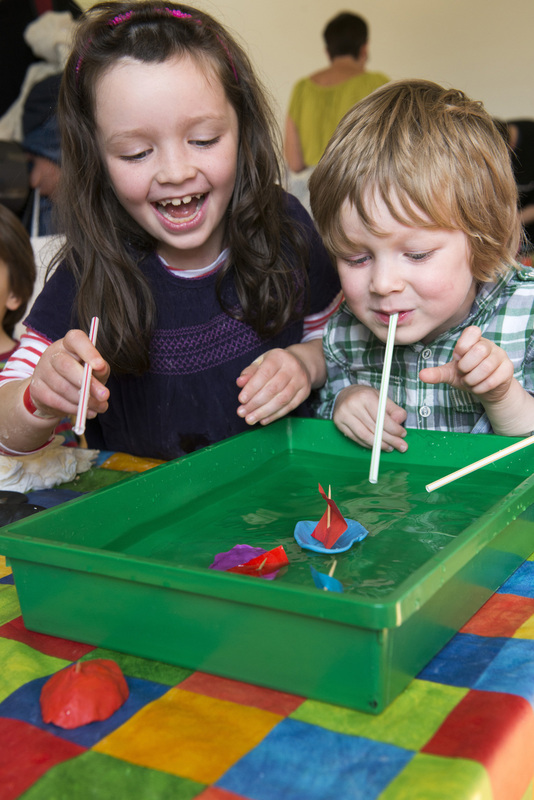 A sequence of short investigations about water resistance using different materials to make and test boats and rafts. How does the energy from a balloon power a model car? Pupils make and keep their own buggies, investigating the variables affecting how they work. "An excellent example of active learning. The class had a brilliant afternoon, and look forward to conducting more testing next week." Five investigations into materials and forces, themed around a circus. "Excellent range of fun activities that children could understand and enjoy, staying on task throughout. Promoted team work and thinking." Six inspiring electrical activities to investigate circuits, their components, conductors and insulators. "Brilliant! Perfectly pitched and so well set out and prepared. Given me confidence to try out something similar as part of a topic." Can pupils test accurately, fairly and process results? An investigation into how much Vitamin C (relatively) is found in different fruits. "The children have never been so enthusiastic about science. Very well taught, organised, resourced and differentiated." An exciting interactive discussion about the origins and properties of waxes, changes of state and non-reversible changes. Time and content vary with age group. "Covered hundreds of learning objectives! I couldn't possibly ask the children what they had learnt because there was so much!" Pupils use litmus to identify acids, and design a fair test to investigate how temperature affects an acid/carbonate reaction. Five short investigations about reflection, casting shadows, how shadows change during the day and light being an energy source. Pupils discuss recycling in general and use old sugar paper to produce new paper. The kids loved this and want to do it again – we will! How does the energy from an elastic band power a small toy? How does friction impede it? Pupils make and keep their own rollers, investigating the variables affecting how far and fast they go. "Practical, hands on, requiring skills such as measuring, decision making, precision and safe use of equipment." This is about combining and separating mixtures of solids, liquids and gases. The workshop ends with an explosive finalé. A sequence of engaging electrical circuit investigations using a variety of small components including solar cells. We use lamps as an indoor alternative in bad weather. "Highly organised, well resourced and, with a wide range of activities, children were expected to discover rather than being spoon-fed." A set of activities about phases of the moon, the solar system, stars and shadows. Pupils also use and evaluate scientific models. "There was a fun element to the workshop and I am particularly looking forward to using the umbragraph next time the topic is being taught." A series of accessible investigations, linked to a picture book, including making trucks, using scientific snow and sand, and investigating rafts. Parents and carers can be invited to take part. "Excellent workshop. The activities engaged all the children and were quick and easy to do. The activities stimulated lots of good discussions among the children. They enjoyed working with the Year 5 pupils and are keen to take all their things home." A set of ten varied physical and chemical experiments, testing ability to follow instructions, observe carefully and record accurately. 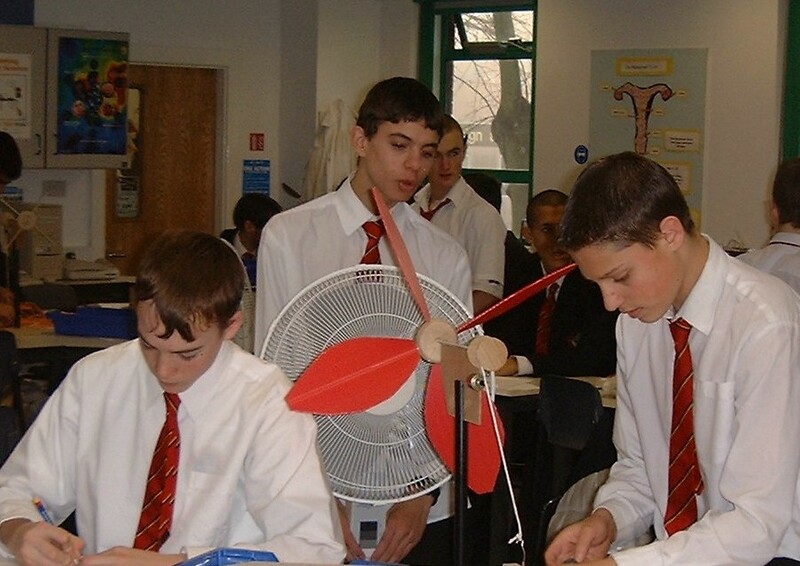 Pupils designing a model wind turbine and investigating variables to improve its efficiency. 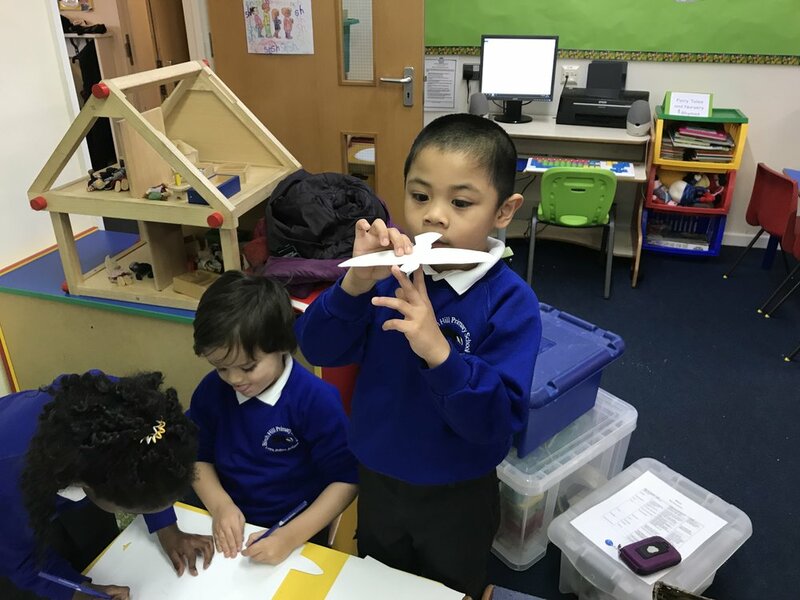 "The children really enjoyed making wind turbines. The content was first class and fitted in well with the science topic on electricity." Our workshop programme is extremely popular so the more lead-time (and choice of dates) you can offer us, the better. All our workshops are designed specifically to develop pupil skills. Notes are provided as support for the teacher to follow up the workshop. We hope that teachers will use the workshop ideas in their own teaching. Some of the workshops need extra support - either adults or pupil helpers. Pupil helpers will have an opportunity to develop science communication skills so the pupils selected to help need to be alert, fairly competent and likely to benefit from taking part. Three workshop sessions will usually fit into a school day. Workshops are designed for a class of about 30 children with their class teacher although variations are possible. For example, with some combinations of workshops, it can be possible to fit four into one day. With some workshops we can see two classes at a time. There is also the possibility of fitting in seven or more workshop sessions where the staff teach alongside us. Please feel free to discuss these options with your Workshop Leader. Workshop days cost £435 (+VAT) but some workshops which take place in areas where Workshop Leaders live might be available at reduced rates. Please note that there might be a small contribution towards accommodation/travel if the Workshop Leader is not local to your area. You might consider 'partnering up' with other schools in your local area to share the cost. Please enquire for more details. There are organisations offering grants to support science activities in schools - click here for more details. All our workshops have the overall aim to “develop understanding of the nature, processes and methods of science; to answer scientific questions about the world around” and cover the teaching of “practical scientific methods, processes and skills." Students each build and test a buggy powered by a balloon. They work out all the independent variables and choose one to investigate its effect on a dependent variable. They can retain their buggies for further testing. Students use different forms of chromatography (including radial and ascending) before investigating how to separate the pigments in grass. Students investigate the amount of Vitamin C in different fruits using DCPIP solution. They need to identify and control all variables to produce accurate results. Students each build and test a wind-up model to determine the optimum value for each variable. They can retain their models for further testing. Students carry out ten simple investigations (all are either physical or chemical changes) which require them to follow written instructions carefully and make accurate observations. Students carry out simple investigations into phases of the moon, the solar system, stars, the night sky, and shadows. They also need to evaluate the modelling concepts used. 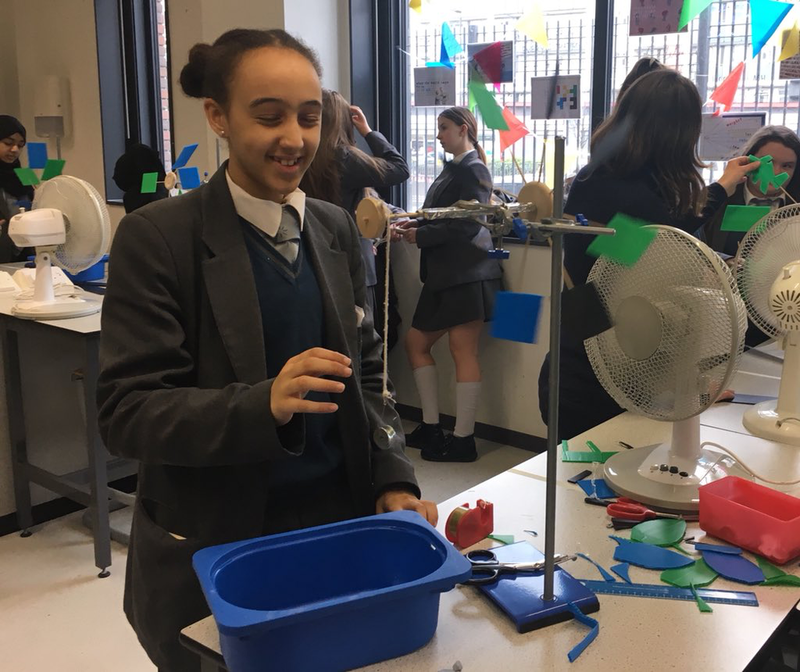 Students are challenged to design a model wind turbine and then to make it more efficient by investigating different variables and measuring the effects. The wind turbines will be tested using an electric fan. Our workshop programme is extremely popular so the more lead-time (and choice of dates) you can offer, the better. Three workshop sessions will usually fit into a school day. Workshops are designed for a class of about 30 students with their class teacher. These workshops are designed specifically to develop students' skills. Notes are provided as support for the teacher to follow up the workshop. We hope that teachers will use the workshop ideas in their own teaching. Workshop days cost £435 (+VAT) but some workshops which take place in areas where Workshop Leaders live might be available at reduced rates. Please note that there might be a small contribution towards accommodation/travel if the Workshop Leader is not local to your area. You might consider 'partnering up' with other schools or community groups in your local area to share the cost. Please enquire for more details. We will give you a discount of 10% on a Workshop Day this year if you booked a full-price Workshop Day during the last academic year or if you recommended us to a school which books us this year. All our workshops encourage curiosity in science with investigations of variables that can be changed quickly to enable students to collect data and/or assess results. All our workshops are practical, exciting and inspiring. This science club project is designed for six Y5 pupils to run sessions (probably at lunch time) for twelve pupils in Y2. This is a really exciting development in promoting science in primary schools and is truly sustainable in that the Y5 pupils will, as Y6 pupils, train up their replacements so that the science club can continue to run indefinitely. SEEDS provides thirty numbered activities; each activity is complete in itself and is suitable for a thirty minute session. These sessions are intended to be short, practical, self-contained and fun. The main aim is to help the Y5 pupils to develop confidence in presentation, communication, planning and organisational skills as well as consolidating their own scientific knowledge. It also encourages all the children involved to think in a scientific way about what they are doing, ask questions and communicate their observations and ideas. The activities relate to scientific content accessible to both age groups. Many are investigations giving opportunities for recording, predictions, fair testing and conclusions based on evidence. Running costs are minimal. This is a small kit containing the specialised materials for fourteen carefully-selected activities. This costs just £140. Other activities can be bought at a reasonable cost as required. This kit contains all the resources for thirty different activities. There is one INSET day for the adult supporter and the Y5 pupils. Ongoing support for the club is available via e-mail. The cost per cluster of five schools is £3700 plus VAT; this includes the SEEDS activity kits, the INSET and ongoing support. For one school in isolation, the cost is £1000 plus VAT. Active clubs can also affiliate themselves to the national STEM Clubs Network which can be contacted at: www.stemclubs.net. "Thanks so much for the brilliant training last week." To find out how to join the SEEDS scheme email us at email@spherescience.co.uk or click here to complete our online form. SPLATS = Students Presenting Learning And Teaching Science. Students present a series of science activities to primary pupils. 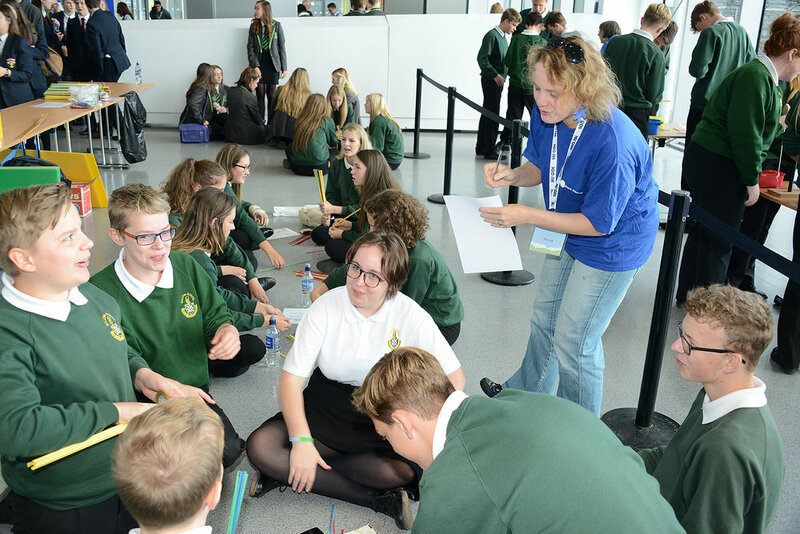 This project brings together secondary schools and their local primary schools to enjoy an exciting practical science day. Each activity also generates resources for the primary school teachers for follow-up work. Typical format: eighteen sixth-form students present six workshop sessions to six classes of Y5 pupil and their teachers. This would all be hosted on the secondary school site. Day 1 the students are trained to present science workshops. Day 2 pupils meet the students and enjoy an action-packed day of workshop sessions. The cost of one SPLATS Project - one training day, one event day and all materials for 180 pupils - is £1800 plus VAT. Variations can be costed accordingly. We will give you a discount of 10% on a SPLATS project this year if you booked one during the last academic year or if you recommended us to a school which books us this year. "An excellent project that both sets of students gained a lot from. The greatest improvement was in the students confidence in their own presentation and communication skills. "I would recommend it. It achieved all that I had hoped it would do but in a number of areas exceeded my expectations." "I really enjoyed the training we received; it was fun, enjoyable and I learnt a lot from the experience. I enjoyed it so much that when our teacher suggested that we could progress our skills further by teaching other year groups I wanted to be involved. In science club myself and a group of friends tried out some experiments and activities that we thought were suitable for year 4s. "I would really encourage anybody who is thinking about doing SPLATS to try it; the experience was an unforgettable one and I really thoroughly enjoyed every minute of it." "I was chosen to take part in SPLATS by my head of chemistry, having shown a great interest in chemistry and sciences during my GCSE studies. "Initially we were taught the many activities that we would be teaching … and over the course of 2 days gave lessons to classes of year 5 pupils from surrounding schools in the local area. "Through being involved in SPLATS I have been inspired to focus my sixth form education towards becoming a chemistry teacher. I would highly recommend SPLATS as it has both improved my teamwork and confidence skills whilst being a thoroughly enjoyable experience." 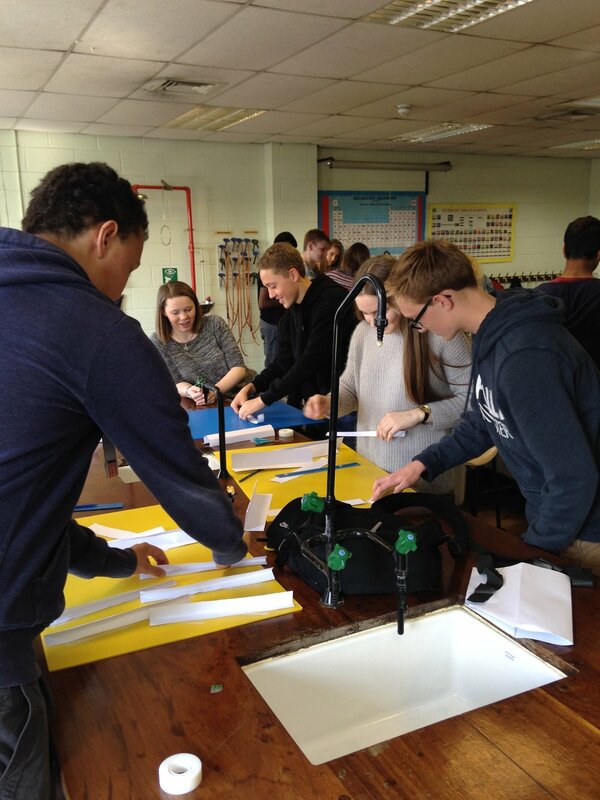 This is a two-day practical science course for trainee teachers. It has been run successfully for seventeen years with students from many universities including Kings College London, Christ Church Canterbury, Sheffield Hallam and Warwick. The course provides experience and confidence in teaching practical, investigative science. The first day is a training day and the second allows the students to work with local primary pupils. It can take place at any point of the teacher training course. "I’m a first year and when I first went into school I had a casual friendly manner and then it is difficult to keep control. This activity has given me a chance to use lots of techniques to manage the class in practical work and I have found class management surprisingly easier than I thought." "My favourite was the electricity we had chance to explore different circuits and the solar cells worked even though it rained." Running a special event? We can run exciting and engaging science activities. Having a family fun day? We can organise it for you. Planning a science festival? We can provide exciting activities. Interacting with local schools? We can provide hands-on workshops. We can design and have run entire family science days for up to 4000 people. Whatever your needs, we can design and provide an activity for you and cost it accordingly. "Thank you again for an exemplary day’s activities at half term. “Exemplary” in a very literal sense: everybody can learn from you. Most particularly, my grandson loved it. What greater accolade could there be!" To contact us please email email@spherescience.co.uk or click here to complete our online form. Encourage public interest in your company. Create a buzz! We can design suitable activities just for you. Simply send us an email email@spherescience.co.uk or click here to complete our online form. On behalf of Urenco Limited, we provide a "Sorting Things" workshop to schools in the Ellesmere Port area. This supports the national curriculum and relates to their industry. Here is a film clip that features it. We now have an agreement with the British Council under a framework agreement for the delivery of STEM education services for the Newton Programme. We have recently been involved with NuGen and their Bright Sparks initiative. "Sphere Science has provided science workshops for three of NuGen’s Bright Sparks’ events, an education programme which focuses on engagement with teachers and pupils at high schools close to NuGen’s Moorside Site and explores educational and societal issues around the need for new electricity production. 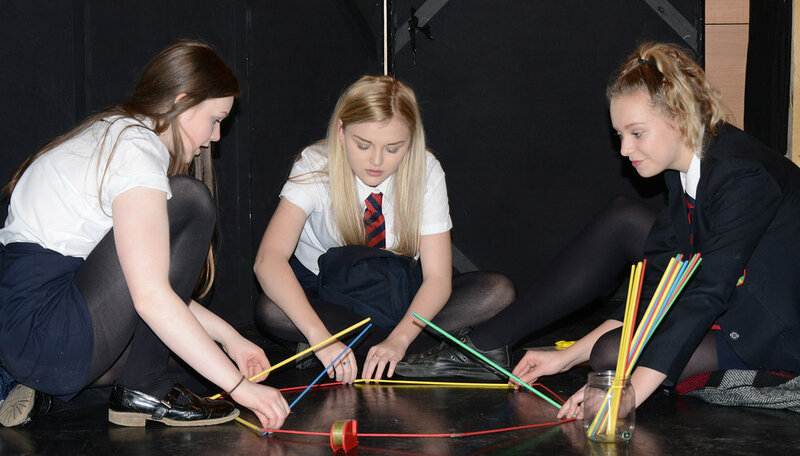 Sphere Science created a range of activities to suit the theme, and delivered them with passion and enthusiasm which was passed on to the pupils. Throughout the event and the lead up Sphere Science were very accommodating and helpful, with nothing being too much trouble. Thank you for all your help and we look forward to working with you again." 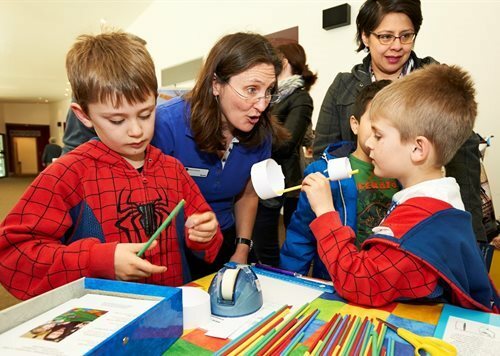 Since 2010 we have provided one of the activities at the annual "Real Science" event held at the Milton Keynes Discovery Centre for about 500 children. For more than a decade we delivered over 6000 workshop days and over 120 Family Days (for up to 2000 people at a time) on behalf of Shell UK. "Through your workshops, family days and teacher training programmes the Shell Education Service has inspired hundreds of thousands of students about science. The Sphere Science team has worked hard to deliver a consistently popular programme, for which we have received much positive feedback from participants over the years. You have provided sound advice about how to engage and inspire primary age children, and successfully delivered the programme on time and on budget. As a way of exciting young children about science, we are proud of what you have achieved and grateful for your hard work and commitment." "The Family Days run by Sphere Science have always been extremely popular with local children and their families. Everyone that takes part has a fantastic time and the kids always come away learning something new." This exciting show comprises a series of “science tricks” with unexpected and surprising outcomes, challenging the audience to think through, with the help of the presenter, how each one works. It is ideal for Science Festivals, for assemblies (R/KS1, KS2 but probably not the whole school together), as part of a larger activity (eg a Family Day) or for an after-school event. We are very flexible. Watch one recent show here. "This show was not just for the kids, the adults really enjoyed it and learnt a lot as well." The cost is £435 for a whole day (3 shows), £270 for a half day (2 shows). Please note that there might be a small contribution towards accommodation if the Presenter is not local to your area. You might consider 'partnering up' with other schools or community groups in your local area to share the cost. We have run courses in Science Learning Centres, universities, teacher centres and schools for twenty years and we continually review and update our materials. Our courses are inspiring and bursting with practical ideas. We are accredited as CP/Inset providers with STEM Learning. We offer CPD to increase confidence in teaching science enquiry and investigative skills, for experienced teachers, new teachers, trainee teachers, and teaching assistants. CPD for teachers with more experience in teaching primary science, including science co-ordinators and subject leaders, to discuss a small range of contexts which may be challenging to present to primary pupils, are likely to introduce misunderstandings, or which are difficult for class teachers to extend (to level 4 in the English Curriculum and beyond). CPD on creating a buzz in science through science clubs, family days and events. 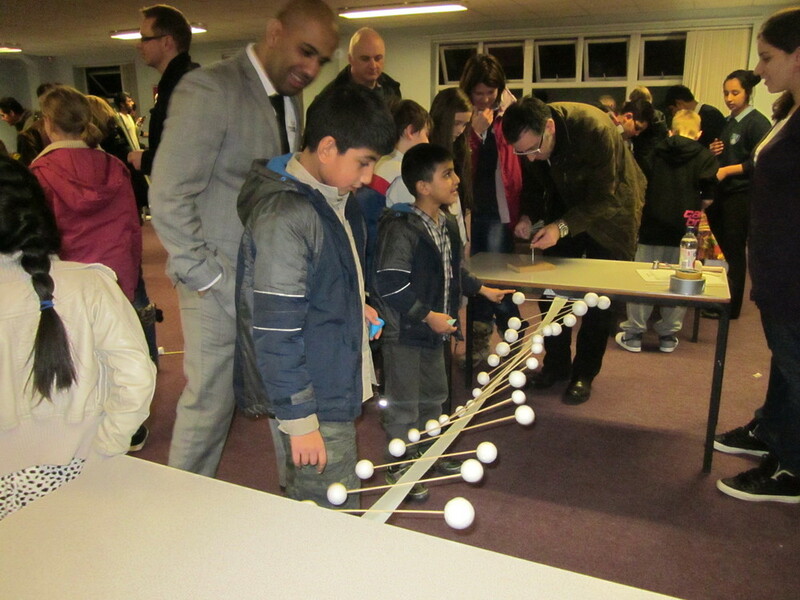 We have over seventeen years' experience of running science clubs and managing family days. "Hands on task / lots of great ideas for science lessons to take back. Whole table felt that the presentation was very good – wish that we had been inspired by science with explorations like today, when we were at school." "Practical ideas / resources / recommended books etc investigative skills, addressed misconceptions. Feel enthused." "Very practical and plenty of ideas across key stages. Excellent." 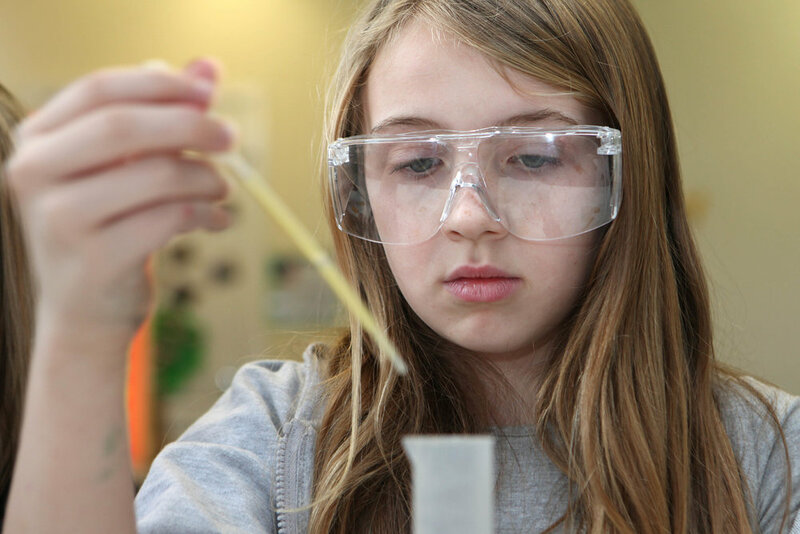 We offer primary INSET days to support the teaching of science enquiry and investigative skills. We aim to increase staff confidence in structuring investigations for themselves and in encouraging pupils to ask questions and look for answers. We design the day to meet the needs of each school's curriculum, focussing activities on materials and their properties and physical processes. Shorter courses are negotiable. We can arrange twilight sessions, but these should normally follow a specifically designed school workshop day with three classes of pupils. As many members of staff as possible should visit the class workshop sessions, so that we can establish an initial framework for discussion in the short twilight INSET. "I'm glad I made the right choice of selecting Sphere Science when looking for someone to share their expertise with us :)"
"I would like to say huge thank you for a lovely inset. Staff were excited and have been asking for some of the resources they used. The inset also encouraged them to think outside the box and as a result they have adapted some of their plans." The usual cost of our one-day course is £520 + VAT. Costs include materials and assumes up to thirty participants at an agreed venue. Notes are available but photocopying is not included. Just send us an email email@spherescience.co.uk or click here to complete our online form. We won't pass this on to anyone else and use it only to reply to this enquiry. Please tick here if you wish to receive our monthly e-newsletter.